Calbuco volcano is a Late Pleistocene composite stratovolcano and member of the Southern Volcanic Zone of the Chilean Andes (41°19′S, 72°36′W). It lies ~ 20 km west of the Liquiñe–Ofqui Fault Zone, but is not located directly upon any major regional structures. During April 2015, a sub-Plinian eruption occurred, with a bulk erupted volume of ~ 0.3–0.6 km3 (~ 0.1–0.2 km3 DRE). The eruption was a rapid-onset event that produced highly crystalline products (from 40 to 60 vol.%) including the mineral phases: plagioclase, clinopyroxene, orthopyroxene, amphibole, olivine, apatite, ilmenite, titanomagnetite and chalcopyrite. An upper-crustal reservoir is inferred using available geophysical data combined with amphibole geobarometry. Consideration of textural features, including high crystallinity, complex mineral zonation, crystal clots and interstitial glass between crystals from clots, suggests the presence of a mush zone within this reservoir. From the nine collected samples, whole-rock chemistry and an array of geothermometers (amphibole, amphibole-plagioclase, two-pyroxenes and Fe–Ti oxides) gave similar results for all samples possessing ~ 40 vol.% of crystals, with the exception of the sample Cal-160 (~ 60 vol.% crystallinity), which is slightly more evolved and yields lower temperatures for all geothermometers. By comparing temperatures calculated in sample Cal-160 using pairs of ilmenite-titanomagnetite core compositions with those calculated using rim compositions, we observe a late-stage temperature increase of between 70 and 200 °C. We suggest that this local-scale heating event was at least partly responsible for triggering the eruption. Our data suggest that the bulk of the erupted magma was derived from a relatively uniform (970–1000 °C), crystal-rich magma mass. Sample Cal-160 was derived from a cooler environment (910–970 °C), where it was subjected to pre-eruptive heating to temperatures considerably higher than those observed in associated, erupted magmas (up to 1070 °C). This requires the involvement of a hot, presumably mafic magma injection at the base of a shallow, crystal-rich reservoir, though the mafic magma was not itself erupted. The localised nature of interaction and rapidity of eruption onset have implications for potential future hazards at Calbuco volcano. The online version of this article ( https://doi.org/10.1007/s00445-019-1280-2) contains supplementary material, which is available to authorized users. Within the continental crust, magma reservoirs are considered to be represented by both magma chambers, these being defined as continuous, melt-rich, lenticular regions where the magma is fluid and eruptible and within which magma crystallinity is < 45 vol.%, and crystal mushes, i.e. a body with a rigid crystal framework and crystallinity > 45% (Marsh 1989, 1996; Hildreth 2004; Bachmann and Bergantz 2008). Crystallinities > 45 vol.% are associated with rheological properties which impede convection processes (e.g. Bachmann and Bergantz 2004, 2008; Huber et al. 2010a; Burgisser and Bergantz 2011; Parmigiani et al. 2014). These reservoirs exist as shallow magma reservoirs (≤ 10 km depth) and may evolve over long cooling periods to become plutons (e.g. Koyaguchi and Kaneko 1999; Claiborne et al. 2010; Cooper and Kent 2014; Molina et al. 2015; Szymanowski et al. 2017; Cooper et al. 2017). Sample mineralogy and whole-rock chemistry are usually studied together in order to understand magma reservoirs. Mineral compositions, however, yield diverse information regarding crystallisation conditions, crystal re-equilibration and timescales, which depend upon the diffusion kinetics of their constituent elements. 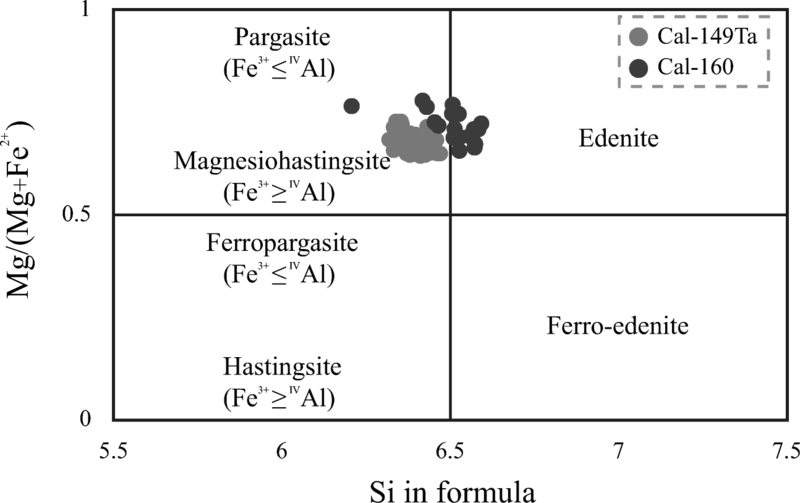 For example, major elements of Fe–Ti oxides show much higher interdiffusivity (Aragon et al. 1984; Aggarwal and Dieckmann 2002a, b) than those of silicate phases (e.g. plagioclase, Grove et al. 1984; clinopyroxene, Müller et al. 2013; orthopyroxene, Ganguly and Tazzoli 1994, Dohmen et al. 2016; and olivine, Dohmen and Chakraborty 2007a, b). Therefore, Fe–Ti oxides equilibrate much faster than silicate phases, typically recording magma eruption temperatures. By contrast, the silicates can provide information on earlier stages of the magmatic history with little re-equilibration. This study reports whole-rock chemistry, mineral chemistry, textural features and calculations of pre-eruptive intensive conditions (geothermometry, geobarometry and oxybarometry) derived from fall deposits of the sub-Plinian eruption of Calbuco volcano (Southern Chile), which occurred on 22–23 April 2015. In doing so, we recognise and quantify a local-scale heating event prior to the eruption, which we interpret to represent an input of new, hot magma beneath an inferred shallow magma reservoir including a mush zone with limited mixing or interaction between the overlying reservoir and the new magma input. Calbuco volcano (41°19′S, 72°36′W) is a Late Pleistocene–Holocene composite stratovolcano (López-Escobar et al. 1992) of the Central Southern Volcanic Zone of the Andes. Its summit is 2003 m above sea level and the basal area of the volcano is 150 km2 (Sellés and Moreno 2011). Calbuco has been catalogued as the third most dangerous Chilean volcanic system (Lara et al. 2011; SERNAGEOMIN 2017). It is located ~ 20 km west of the Liquiñe–Ofqui Fault Zone (LOFZ; Fig. 1), a major dextral, transpressive strike-slip structure of the Southern Volcanic Zone (Cembrano et al. 1996, 2000). According to Sellés and Moreno (2011), however, Calbuco volcano is not itself located directly upon any major regional structure. The basement of the area is composed of late Palaeozoic metamorphic rocks from the Sotomó–Chaiquenes (Thiele et al. 1985) and Lenga (SERNAGEOMIN – BRGM 1995) metamorphic complexes and later plutonic rocks, which are members of the Miocene plutonic belt of the Northern Patagonian Batholith (López-Escobar et al. 1992; Adriasola et al. 2006). The Calbuco volcanic edifice immediately overlies Early Pleistocene volcanic sequences (the Hueñuhueñu and Reloncaví strata; López-Escobar et al. 1995b). The construction of the Calbuco edifice is ~ 300 ka old (Sellés and Moreno 2011) and is characterised by alternations between lava flows (basaltic to basaltic andesitic with rare dacite), andesitic to dacitic domes and layers of pyroclastic tephras, block and ash flows, and deposits from hot and cold lahars (López-Escobar et al. 1992, 1995a, b; Petit-Breuilh 1999; Moreno et al. 2006; Stern et al. 2007; Castruccio et al. 2010; Sellés and Moreno 2011; Watt et al. 2011; Daga et al. 2014). The dominantly andesitic composition of its products (with high Sr isotope ratios and low Nd isotope ratios; López-Escobar et al. 1995b), combined with the presence of crustal xenoliths and magmatic amphibole phenocrysts, make this volcano notably more evolved by comparison to other nearby volcanic complexes such as Osorno volcano (Parada 1990; López-Escobar et al. 1992, 1995a, b; Hickey-Vargas et al. 1995). The long-term evolution of the products of Calbuco volcano has been divided into four units (Lahsen et al. 1985; López-Escobar et al. 1992, 1995b; Sellés and Moreno 2011); details of the three prehistoric units (Calbuco 1, 2 and 3) are shown in Table 1 and details of the historical unit (Calbuco 4) are shown in Table 2. During 22–23 April 2015, two sub-Plinian eruptive events occurred at Calbuco volcano. The first eruptive pulse started on 22 April at 17:50 local time (20:50 UTC) and the second started on 23 April at 01:00 local time (04:00 UTC) (SERNAGEOMIN 2015a, b, c, d). These pulses produced eruptive columns with heights exceeding 15 km (SERNAGEOMIN 2015e; Romero et al. 2016; Van Eaton et al. 2016). Van Eaton et al. (2016) reported pyroclastic density currents (PDCs) at the end of the first eruptive pulse, with the largest PDCs occurring at the onset of the second eruptive pulse. During the entire eruption sequence, primary and secondary lahars were generated on the S, N and NE flanks and no lava flows were emitted (Castruccio et al. 2016). 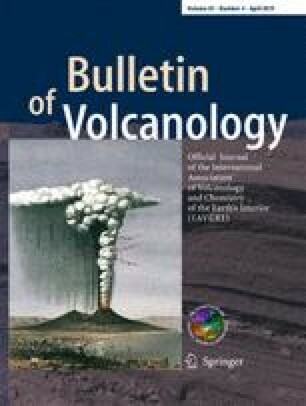 Several authors have estimated the bulk erupted volume during the eruption: 0.27 km3 (0.11–0.13 km3 dense rock equivalent, DRE; Romero et al. 2016), 0.56 ± 0.28 km3 (0.18 ± 0.09 km3 DRE; Van Eaton et al. 2016), 0.38 ± 0.1 km3 (0.15 km3 DRE; Castruccio et al. 2016) and 0.37–0.6 km3 (Delgado et al. 2017). The eruption had a volcanic explosivity index (VEI) of 4, based on the estimated bulk volumes (Romero et al. 2016; Van Eaton et al. 2016). Most of the products were erupted during the first pulse (Romero et al. 2016). In terms of precursory activity, Valderrama et al. (2015) reported 147 seismic events occurring from 1 January to 21 April 2015, of which 142 were volcano-tectonic (VT, related to fracturing of the wall rock) and 5 were long-period (LP, related to collapse of gas bubbles in rising magma or fluid movement events). From February 2015, there was an increase in low-magnitude VT seismic activity and later, during 22 April, a seismic swarm of 140 VT events was recognised starting just 3 h before the eruption onset (SERNAGEOMIN 2015f). The first LP events were registered at 16:34 local time (19:34 UTC, ~ 1.5 h before the eruption) and during the second pulse there was an increase in the number of VT seismic events (SERNAGEOMIN 2015g). Although no deformation was recognised up to 1.5 days before the eruption, deflation was documented during the eruption (Delgado et al. 2017), which agrees with the contemporary tiltmeter information (Valderrama et al. 2015). According to Delgado et al. (2017) the deformation source models are consistent with a deflation between 8 and 11 km depth. The consequences of the eruption were not only local, where chemical-climate interaction modelling suggests that the 2015 Calbuco eruption led to an increase in the areal extent of the Southern ozone hole by 4.5 × 106 km2 (Ivy et al. 2017). Although on 30 April there was another eruptive pulse, this was a steam-driven eruption with little participation of fresh magma. The plume reached < 5 km above the vent with dispersion towards the SE (SERNAGEOMIN 2015g; Van Eaton et al. 2016). The registered deformation during this eruptive event was negligible (Delgado et al. 2017). 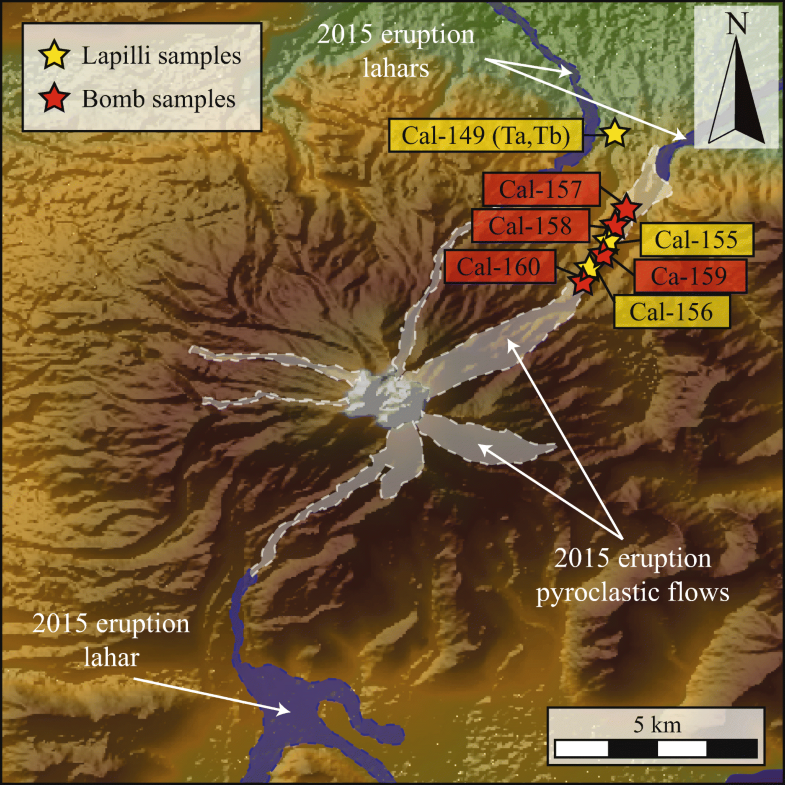 Nine samples (four lapilli-sized pyroclasts from fall deposits and five bombs from pyroclastic density current deposits) were collected from the products of the 2015 Calbuco eruption deposits from seven locations (Fig. 2). Whole-rock compositions of three lapilli and four bomb samples were analysed via XRF (for major elements) at Acme Analytical Labs (Vancouver, Canada) using OREAS-184 and SY-4 standards for all the major elements, and CCU-1D and OREAS-700 standards for FeO. Accuracy for major elements in all standards is better than 3% (relative) except for TiO2 in SY-4 which is 4.5% (relative) and P2O5 in OREAS-184 and SY-4 which are 14% and 17% (relative), respectively. Trace element compositions were analysed via ICP-MS at the Open University (Milton Keynes, UK) using the BHVO-2, JB-2 and AGV-1 standards. The reproducibility of analyses was better than 8% (relative; 2σ) and accuracy in the trace elements in JB-2 (n = 5), BHVO-2 (n = 2) and AGV-1 (n = 2) is better than 10%, except in Ni (21% in AGV-1) and Pb (13% in BHVO-2). Major and minor element concentrations (Si, Ti, Al, Fe, Mn, Mg, Ca, Na, K, Cr, Cl and F) were measured in the cores of amphibole grains. The analytical conditions consisted of an accelerating potential of 20 keV and focused beam for all the elements. An electron beam current of 15 nA was used for Si, Ti, Al, Fe, Mn, Mg, Ca, Na, K and Cr, whereas a current of 100 nA was used for F and Cl. Counting times were 30 s for Ti, Al, Cr, Fe, Mn, Mg, Ca and Na; 40 s for Si, 100 s for F and 80 s for Cl. Values of Fe3+ were obtained following the formulation of Leake et al. (1997). 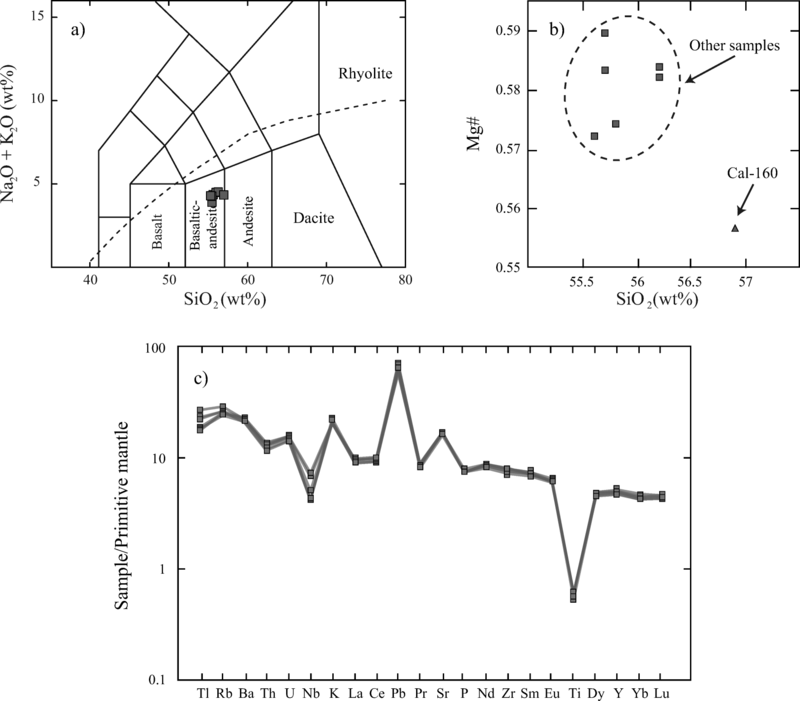 Compositional profiles (spacing ∼ 4–8 μm) of major (Si, Al, Ca, Na and K) and minor (Ti, Fe, Mg, Sr and Ba) element concentrations were obtained in plagioclase phenocrysts. The analytical conditions consisted of an accelerating potential of 20 keV and electron beam current of 10 nA for major elements and 40 nA for minor elements with a defocused beam (2 to 5 μm) in order to reduce volatile alkali loss. Counting times for major elements were 32 s, 240 s for Ti, Fe and Ba, and 480 s for Mg and Sr. Concentrations of major (Si, Mg, Fe and Ca), minor and trace (Ti, Al, Mn, Cr, Ni) elements were obtained in pyroxene phenocryst cores and rims. The analytical conditions consisted of an accelerating potential of 20 keV and electron beam current of 30 nA with a focused beam. Counting times for major elements were 60 s and 80 s for minor and trace elements. Values of Fe3+ were obtained following the formulation of Putirka (2008). Compositional profiles (spacing ∼ 2–3 μm) of major (Ti, Fe and O) and minor and trace (Al, Mg, Ca, Mn, V, Cr, Zn, Ni, Co and Si) elements were measured in titanomagnetite and ilmenite. The analytical conditions consisted of an accelerating potential of 15 keV and electron beam current of 30 nA with a focused beam. Counting times for all the elements were 60 s except for O, in which counting times were 260 s. Values of Fe3+ were obtained following the formulations of Droop (1987) for ilmenite grains and Stormer (1983) for titanomagnetites. Concentrations of major (Si, Mg and Fe), minor and trace (Al, Ni, Mn, Ca) elements were obtained in the core of olivine phenocryst. Analyses were taken away from grain boundaries in order to avoid secondary fluorescence issues during the acquisition of Ca concentrations (cf. Dalton and Lane 1996). The analytical conditions consisted of an accelerating potential of 20 keV and electron beam current of 30 nA for Si, Fe, Mg and Mn and 100 nA for Al, Ni and Ca, all with a focused beam. Counting times for all the elements but Ca were 40 s and 400 s for Ca. The methods of Ridolfi et al. 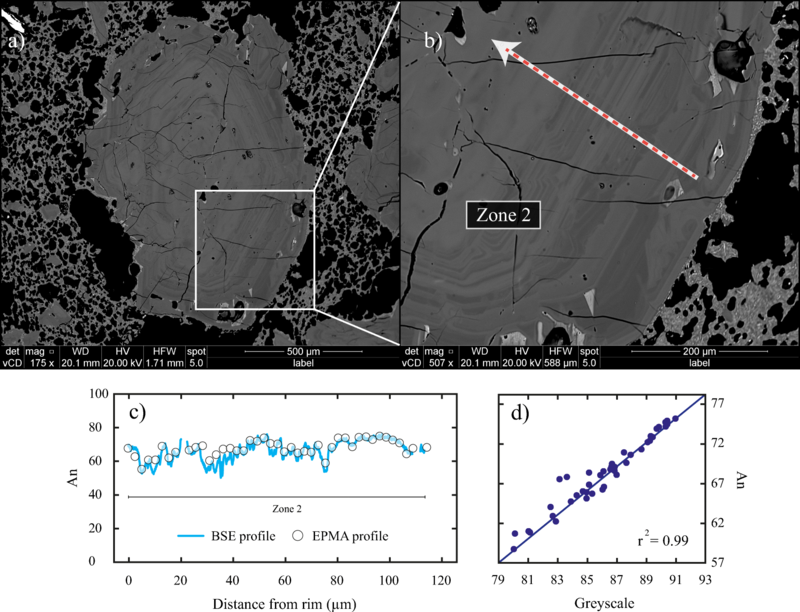 (2010) and Ridolfi and Renzulli (2012) are used to calculate intensive conditions (T, P and fO2) ) independently in 109 amphibole cores from both Cal-149Ta (light-brown lapilli) and Cal-160 (white bomb) samples. The Holland and Blundy (1994) thermometry is applied using core compositions of 16 plagioclase-amphibole pairs, where equilibrium is assumed because the plagioclase crystals are found as inclusions in amphibole phenocrysts. Two-pyroxene thermobarometry (Putirka 2008) is used with 35 ortho- and clinopyroxene pairs that passed the test for equilibrium according to the Putirka (2008) chemical filter across the nine samples. 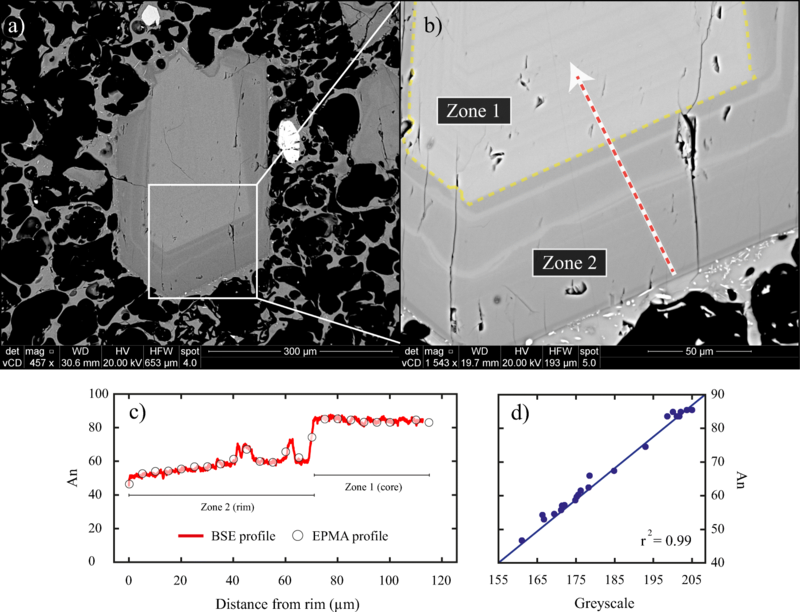 The Ghiorso and Evans (2008) thermoxybarometer is applied to compositions of crystal cores and close (~ 2 μm to the interface) to ilmenite-titanomagnetite grain boundaries. 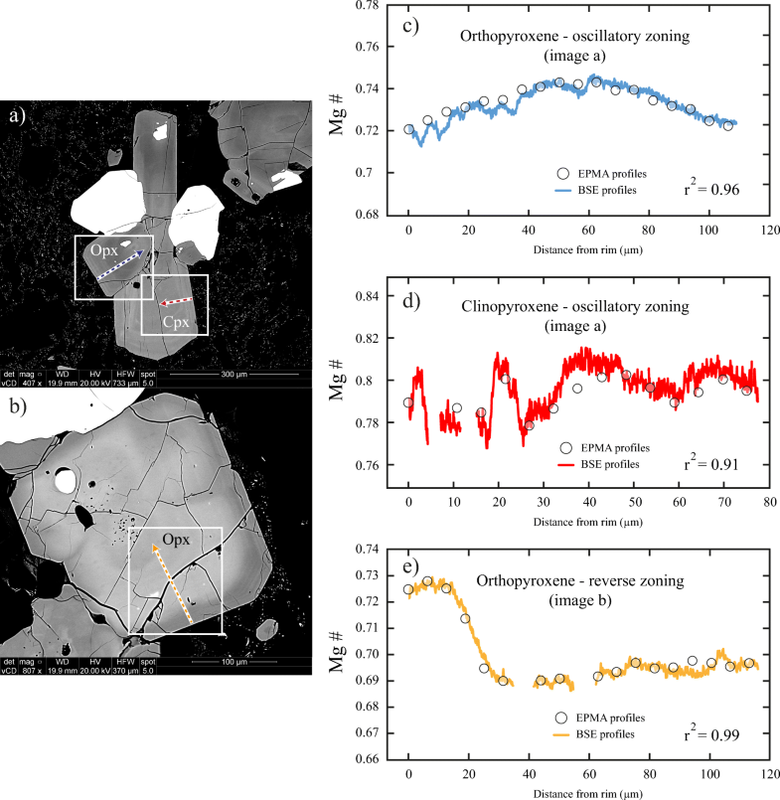 The Ca-in-olivine thermometer of Shejwalkar and Coogan (2013) is applied to core composition data from 16 olivine phenocrysts in crystal clots, where equilibrium with the surrounding crystal phases (plagioclase, clinopyroxene and orthopyroxene) is assumed due to textural relation and chemical filters (cf. Grove et al. 1997). Nine calculated temperatures were discarded, due to the low forsterite content (Fo61–68) of the crystals considering Fo70 as the lower limit of the calibration of the thermometer (Shejwalkar and Coogan 2013). The error propagation of geothermo- and geobarometers is carried out considering both internal uncertainties (associated with the experimental method) and external uncertainties (associated with precision and accuracy electron microprobe analyses). In later parts of this work, MELTS modelling uses the intensive physical variables derived from the thermobarometry (see ‘Intensive variable conditions’ section). According to Castruccio et al. (2016) the fall deposits of the 22–23 April eruptions are made up of four sub-units: the lower layer (unit 0) corresponds to the first event and is composed mainly of light-brown, highly vesicular basaltic andesite scoria and up to 10 vol.% of lithics. Layers 1, 2 and 3 correspond to the second (largest) event and there is a transition in the dominant clast type present in the deposits, from light-brown scoria in layer 1 to dark-brown, dense juveniles with the same composition within layer 3. Samples Cal-149Ta, Cal-155 and Cal-156 correspond to layer 1, the sample Cal-149Tb corresponds to layer 3, samples Cal-157, Cal-158 and Cal-159 correspond to scoriaceous bombs from PDCs, and sample Cal-160 corresponds to a distinctive, white bomb with darker zones extracted from a PDC deposit. All samples are porphyric, with ~ 35 to 65 vol.% of phenocrysts. Dominant mineral phases present in all the samples are plagioclase, orthopyroxene and clinopyroxene. Minor phases include amphibole (only in Cal-149Ta and Cal-160), olivine (in all samples except Cal-160), titanomagnetite, ilmenite, apatite and chalcopyrite. All the mineral phases are present as clots of crystals and isolated crystals. The samples exhibit crystallinities of ~ 40 vol.% except for Cal-160, which shows a higher crystallinity of ~60 vol.% (Table 3). The samples show a large range of vesicularities: from 15 to 60 vol.% and the highest values correspond to light-brown lapilli (samples Cal-149Ta, Cal-155, Cal-156) from 42 to 60 vol.% (see details in Table 3). The crystallinity percentages and quantification of the main petrographic of the collected products of the April 2015 Calbuco eruption were obtained by image processing techniques via ‘Background Extraction’ of pseudo-coloured images through the freeware JMicrovision. All the samples correspond to calc-alkaline basaltic-andesites (55.6–56.9 SiO2 wt.%; Fig. 3a). The Mg# (Mg# = molar Mg/(Mg + Fe2+)) values are from 0.56 to 0.59. The maximum SiO2 content (56.9 wt.%) and the minimum Mg# (0.56) correspond to the Sample Cal-160 (Table 4; Fig. 3). All samples show similar rare earth elements (REE) patterns, with a narrow range of LaN/YbN (2–2.4); only the sample Cal-155 shows a slight positive Eu anomaly (see Online Resource 1). The spider diagram of the studied samples shows similar trends in all samples and display positive Rb, Pb and Sr anomalies and negative Nb, P and Ti anomalies, which are typical of magmas from arc settings (Fig. 3c). Plagioclase phenocrysts are 0.1–2.0 mm in size and can be found as isolated crystals and as members of cumulocrysts and glomerocrysts (together with pyroxene, olivine, titanomagnetite, apatite, amphibole and scarce sulphides). Most of the plagioclase phenocrysts display zonation patterns with distinct cores and rims, with the exception of some crystals found as inclusions in amphibole and pyroxene crystals. Crystal core shapes are euhedral to subhedral, resorption features and patchy zonation are not recognised. Core compositions correspond to zone 1 compositions. The rims have variable thickness (from 20 to 280 μm) and their compositions correspond to zone 2 compositions. These plagioclase crystals show oscillatory zoning within zone 2 compositional range. Resorption and sieve texture as well as patchy zoning are very common. Plagioclase grains found as inclusions in amphibole have compositions in the range An50–89. Amphibole phenocrysts are found only in Cal-149Ta (fall deposit, layer 1) and Cal-160 (white bomb from PDC). All Cal-149Ta amphiboles of Cal-149Ta are pargasites (after Leake et al. 1997; Mg# = 0.64–0.74; Si apfu = 6.3–6.5; Fig. 7) and can be found as isolated crystals and glomerocrysts (together with plagioclase, pyroxene, titanomagnetite, olivine, ilmenite and apatite). All amphibole phenocrysts are euhedral and usually contain plagioclase inclusions. In sample Cal-160, 70% of the amphiboles are edenite (NaCa2Mg5(AlSi7)O22(OH)2) (after Leake et al. 1997; Mg# = 0.65–0.77; Si apfu = 6.5–6.6; Fig. 8), and 30% are pargasites (NaCa2(Mg,Fe)4Al(Al2Si6)O22(OH)2) (after Leake et al. 1997; Mg# = 0.71–0.77; Si apfu = 6.2–6.5). In contrast to Cal-149Ta, amphiboles in Cal-160 are anhedral and are found as members of glomerocrysts (together with plagioclase, pyroxene, titanomagnetite, olivine, ilmenite and apatite). Ilmenite grains are scarce and have composition of Xilm (i.e. the cation atomic proportion of Ti) = 0.77–0.85 (i.e. Xhmt, the cationic proportion of Fe2+ = 0.15–0.23). They occur as both inclusions and in contact with titanomagnetites. Titanomagnetites can be classified into two groups: high-Ti, with a relatively high ulvöspinel component (Xusp = 0.42–0.46; Xmgt = 0.54–0.58) and low-Ti (Xusp = 0.10–0.17; Xmgt = 0.83–0.9). They appear as isolated crystals or in clots of crystals together with amphibole, plagioclase, pyroxene, olivine, ilmenite and apatite. Pyroxenes are found both as isolated grains and as members of clots of crystals together with amphibole, plagioclase, pyroxene, olivine, ilmenite, titanomagnetite, apatite and chalcopyrite (see Online Resource 2). All the pyroxene crystals exhibit slight reverse and oscillatory zoning. Clinopyroxene crystals exhibit reverse zoning, from En43–47Fe9–15Wo40–44 (Fig. 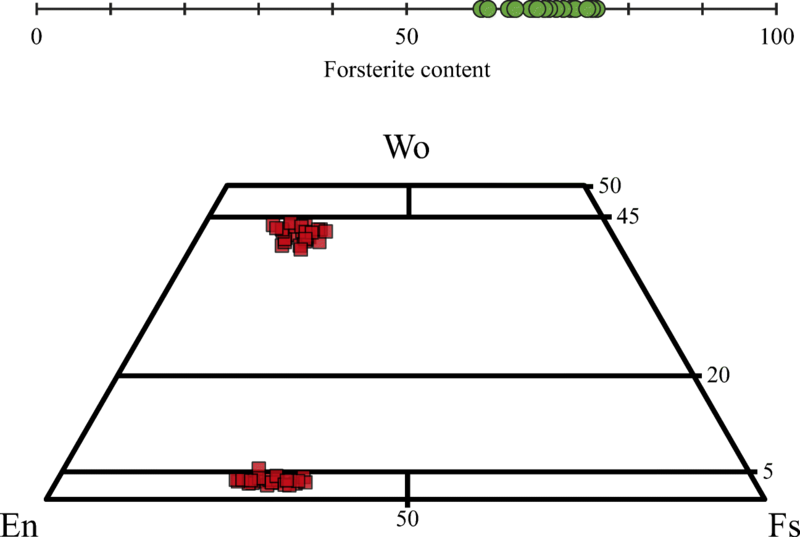 8) composition in the cores to En44–46Fe10–12Wo43–45 composition in the rims (Figs. 8 and 9); oscillatory zoning with compositions of En43–46Fe10–13Wo42–45 (Figs. 8 and 9) have also been observed. Orthopyroxenes exhibit reverse zoning from En67–69Fe29–31Wo2–3 composition in the cores to En69–71Fe26–28Wo2–3 composition in the rims (Fig. 9); oscillatory zoning with compositions of En69–72Fe24–27Wo2–4 (Figs. 8 and 9) have also been recognised. Olivine grains are found surrounded by pyroxene and titanomagnetite crystals (see example images on Online Resource 2). Their composition of Fo60–75 (Fig. 8) is fairly homogeneous for each crystal, thus no zonation patterns are recognised. Olivine crystals were found in all the samples except Cal-160 (Table 3). Mineral pairs measured in all samples except Cal-160 give temperatures of 958–1013 ± 56 °C (Fig. 10; Table 5), with an average of 984 °C (σ = 12 °C), and pressures of 1.5–4.7 ± 3.2 kbar (Table 5), with an average of 3.3 kbar (σ = 0.8 kbar). The pairs measured in the sample Cal-160 give temperatures of 944–981 ± 56 °C (Fig. 10; Table 6), with an average of 968 °C (σ = 13 °C), and pressures of 3.9–6.8 ± 3.2 kbar (Table 6), with an average pressure of 5.7 kbar (σ = 1.3 kbar). Sample Cal-149Ta (light-brown lapilli): The thermometer of Ridolfi et al. (2010) gives temperatures of 894–922 ± 24 °C (Fig. 10; Table 5), with an average temperature of 906 °C (σ = 7 °C), a range and average which is slightly lower than those obtained by two-pyroxene thermometry. The pressure conditions obtained using the Ridolfi et al. (2010) barometer are 2–2.6 ± 0.3 kbar (Fig. 11; Table 5), with an average pressure of 2.3 kbar (σ = 0.1). The relative oxygen fugacity values given by the Ridolfi et al. (2010) oxygen barometer are between 0.2 and 0.5 (± 0.4) ΔNNO units (Table 5), with an average of 0.3 ΔNNO (σ = 0.1). The Ridolfi and Renzulli (2012) thermometer yields temperatures of 882–910 ± 16 °C (Fig. 10; Table 5), with an average temperature of 897 °C (σ = 7 °C). For the same amphiboles, pressures of 1.9–2.3 ± 0.4 kbar (Fig. 11; Table 5), with an average of 2.1 kbar (σ = 0.1 kbar), are obtained. The relative oxygen fugacities given by the Ridolfi and Renzulli (2012) oxygen barometer are between − 0.9 and − 0.2 ΔNNO (Table 5), with an average of − 0.6 ΔNNO (σ = 0.1). Sample Cal-160 (white bomb): Temperatures obtained by the thermometer of Ridolfi et al. (2010) are 862–886 ± 23 °C (Fig. 10; Table 6), similar to Cal-149Ta amphibole temperatures, with an average of 874 °C (σ = 7 °C). The Ridolfi et al. (2010) barometer gave pressures between 1.6 and 2 ± 0.3 kbar (Fig. 11; Table 6) and an average pressure of 1.8 kbar (σ = 0.2 kbar). The relative oxygen fugacity values are between 0.2 and 0.5 ± 0.4 ΔNNO (Ridolfi et al. 2010; Table 6), with an average of 0.3 ΔNNO (σ = 0.1). The Ridolfi and Renzulli (2012) thermometer gives temperatures of 823–859 ± 23 °C (Fig. 10; Table 6) with an average of 842 °C (σ = 11 °C). The same amphiboles gave pressures of 1.4–1.8 ± 0.4 kbar (Fig. 11; Table 6), with an average pressure of 1.6 kbar (σ = 0.1 kbar). According to the oxygen barometer of Ridolfi and Renzulli (2012), oxygen fugacity is between 0.4 and 0.8 ΔNNO (Table 6), with an average of 0.7 ΔNNO (σ = 0.1). Twelve pairs of amphibole-plagioclase in sample Cal-149Ta give equilibrium temperatures of 945–1018 ± 42 °C (Fig. 10; Table 5), with an average temperature of 977 °C (σ = 26 °C). Sample Cal-160 gives lower equilibrium temperatures of 902–934 ± 42 °C (Fig. 10; Table 6) with an average temperature of 914 °C (σ = 18 °C). All these temperatures are higher than those obtained by the methods of Ridolfi et al. (2010) and Ridolfi and Renzulli (2012) based on single amphibole compositions. Ilmenite–titanomagnetite pairs are found only in samples Cal-149Tb (very scarcely), Cal-155 (very scarcely) and Cal-160 (common), and give temperature and oxygen fugacity values which all fell within the calibrated temperature and oxygen fugacity ranges of 800 to 1300 °C, and − 3 to + 3 log units ΔNNO, respectively. The core compositions gave large ranges of both temperature (841–966 ± 22 °C; Fig. 10) and oxygen fugacity (0.2–0.75 ± 0.9 ΔNNO; Table 7); the rims give significantly different intensive conditions only in the sample Cal-160, with calculated temperatures ranging from 900 to 1073 °C (Fig. 10) and oxygen fugacities from 0.2 to 0.75 ± 0.1 ΔNNO (Table 7). Details of intensive conditions related to each ilmenite–titanomagnetite pair and associated errors are given below and included in Table 7. Samples Cal-149Tb and Cal-155: Temperatures are calculated from four core compositions of ilmenites and associated titanomagnetites considering diverse measurements (details in Online Resource 3). Individual pairs of grains show fairly constant compositions and, consequently, similar temperatures and oxygen fugacities, but different temperatures are obtained in different samples (see Table 7). For the sample Cal-149Tb, the temperatures are 961–1008 ± 22 °C (average 982 °C, σ = 23 °C) and oxygen fugacities are 0.36–0.45 ΔNNO (average 0.41 ΔNNO, σ = 0.04); for sample Cal-155, temperatures are 902–922 ± 22 °C (average 907 °C, σ = 10 °C) and oxygen fugacities are 0.17–0.23 ΔNNO (average 0.2 ΔNNO, σ = 0.13). Sample Cal-160: In every crystal pair, compositions close to the boundary between these two mineral phases give considerably higher temperatures and slightly lower oxygen fugacity than core compositions (see Table 7). Cal-160 core temperatures are 841–894 ± 17 °C (average 870 °C, σ = 18 °C) with oxygen fugacities of 0.5–0.94 ± 0.09 ΔNNO (average 0.64 ΔNNO, σ = 0.18), whereas rim temperatures are 947–1073 ± 23 °C (average 1018 °C, σ = 45 °C) and oxygen fugacities are 0.21–0.75 ± 0.09 ΔNNO (average 0.48 ΔNNO, σ = 0.16). Seven olivine cores give temperatures of 987–1019 ± 22 °C (Fig. 10; Table 5), with an average temperature of 997 °C (σ = 13 °C). These Ca-in-olivine temperatures are therefore consistent with those obtained using the two-pyroxenes, Fe–Ti oxides and plagioclase-amphibole thermometers for the same samples. The initial melt composition used in MELTS (Ghiorso and Sack 1995) modelling corresponds to the anhydrous groundmass composition of sample Cal-159 (Table 4) because it shows the highest Mg# (0.59), and possesses representative mineral assemblages and textural features observed in all April 2015 Calbuco products. The initial composition is calculated via an extraction of the modal composition of representative mineral phases from the whole-rock composition of the sample (Table 3). Details of the MELTS modelling results are available as Online Resource 4. Zone 2 compositions of plagioclase phenocrysts (later rims and crystals) and the entire range of observed clinopyroxene and orthopyroxene compositions are reproduced by MELTS at conditions of 2–4% dissolved water, 2–6 kbar of pressure, temperatures from 900 to 1060 °C and crystallinity of 16–35 wt.%. 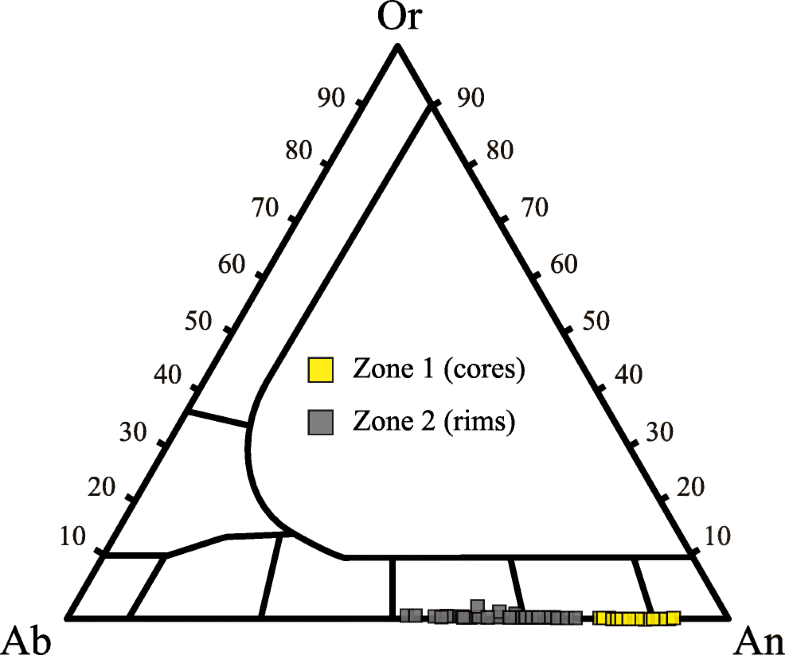 Conversely, the zone 1 composition of older plagioclase phenocryst cores and the remaining phases (notably amphibole, olivine and Fe–Ti oxides) are not reproduced. Crystallisation modelling of the products gives a range of solid phases between 16 and 35 wt.%. This range does not consider other mineral phases that could not be reproduced by MELTS (amphibole, olivine, ilmenite, titanomagnetite and zone 1 of plagioclase phenocrysts), which increases the crystallinity considerably (see details in Online Resource 4). All the April 2015 Calbuco samples studied here (including sample Cal-160) have characteristics typical of Calbuco’s products documented previously for all the volcanic units by López-Escobar et al. (1995b), Moreno et al. (2006), Sellés and Moreno (2011) and Daga et al. (2014). These include whole-rock chemistry, mineral assemblage and textural features (cf. Tables 1 and 2). Additionally, the trace-element data (Fig. 3c) show no significant differences in either elemental concentrations or distribution patterns across the whole sample suite (including Cal-160). Of the whole-rock chemistry of the April 2015 Calbuco eruption presented here (55.6–56.9 wt.% SiO2), the compositions are very similar to those reported for this eruption by Castruccio et al. (2016) for scoriaceous, pumiceous and dense juvenile products (54.5–58.1 wt.% SiO2). Further, the composition of the products analysed here are chemically within the range of older units (unit 1—50.5–60.3 wt.% SiO2, unit 2—57.1–61 wt.% SiO2, unit 3—54.3–64.5 wt.% SiO2; López-Escobar et al. 1995b; Sellés and Moreno 2011) and other deposits of unit 4 (54.8–58.6 wt.% SiO2; López-Escobar et al. 1995b). 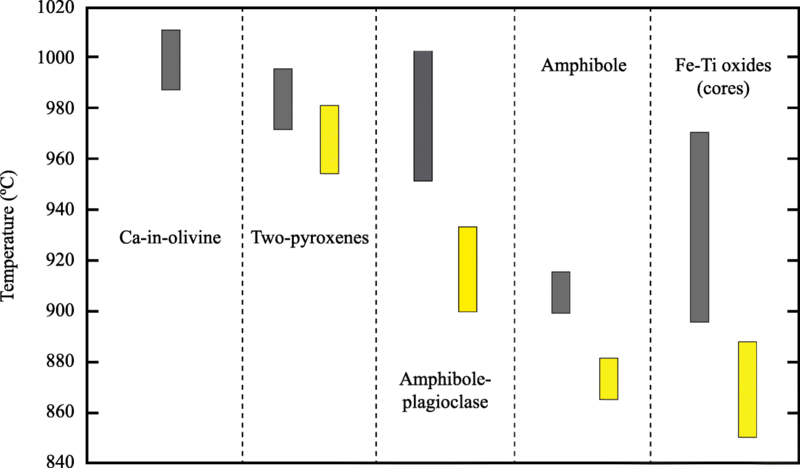 The mineral assemblage has been fairly constant during the history of the volcano (Sellés and Moreno 2011), it being composed of plagioclase, clinopyroxene, orthopyroxene, amphibole, ilmenite, titanomagnetite and olivine (see Table 1), the latter always being surrounded by pyroxenes, plagioclase and Fe–Ti oxides. The Calbuco volcanic products of 2015 possess several features that have been regarded as consistent with mush-zone magma storage, in the manner proposed by, for example, Hildreth (2004) and Bachmann and Bergantz (2006). These features include high crystallinity (~ 40–60 vol.%) of the volcanic products (cf. Hildreth 2004; Bachmann and Bergantz 2006), the presence of clots of crystals where interstitial glasses are locally well preserved and compositionally different from the outer glasses (e.g. Saunders et al. 2010; Passmore et al. 2012; Spera and Bohrson 2018) and the presence of complex textural features that suggest episodes of re-equilibration (cf. Moore et al. 2014). Although only small compositional ranges are recognised here for Calbuco in plagioclase, pyroxene and amphibole, the complex mineralogical textures commonly observed indicate a prolonged history of crystallisation and with changes in either temperature, pressure, melt composition, oxygen fugacity or other intensive variables through a protracted period of time (see Figs. 5, 6 and 9). Our assumption that at the Cal-159 groundmass is a reasonable proxy for the melt composition in equilibrium with the crystal mush is supported by the MELTS modelling which can reproduce the compositions of the dominant crystal phases of plagioclase (zone 2), ortho- and clino-pyroxene. Pressure ranges obtained via amphibole barometry (considering average and standard deviation pressures) suggest the location of the mush reservoir at shallow depth. The barometer calibrated by Ridolfi et al. (2010) gives pressures equivalent to '5.8–9.5 km depths, while the barometer calibrated by Ridolfi and Renzulli (2012) gives pressures equivalent to 5.1–8.4 km depths (each considering a crustal density of 2.8 g/cm3; Fowler 2005). These depth ranges have some degree of overlap with the source of co-eruptive subsidence located between 8 and 11 km depth by Delgado et al. (2017). In addition, the barometry results are consistent with the source related to the seismic swarm that occurred a few hours before the eruption, this being a VT event of depth between 7.1 and 7.4 km (SERNAGEOMIN 2015h, i). 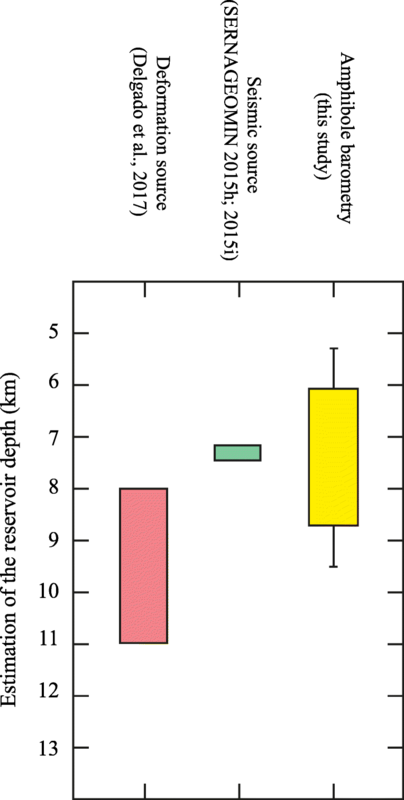 A summary of inferred depths for the reservoir that fed the eruption is given in Fig. 11. The shallow reservoir suggested in this figure would belong to upper crustal magma storage (Tašárová 2007). This is distinct from the crystallisation of crustal xenoliths at 6–8 kbar (equivalent to depths of 21 to 28 km) reported by Hickey-Vargas et al. (1995) based on amphibole barometry on samples of the 1961 eruption. These results suggest middle to lower crustal storage of the 1961 magma. In several volcanic complexes of the Southern Andes, mush magma reservoirs have been recognised in the upper crust (e.g. at Llaima, Bouvet de Maisonneuve et al. 2012; and Quetrupillán, Brahm et al. 2018). 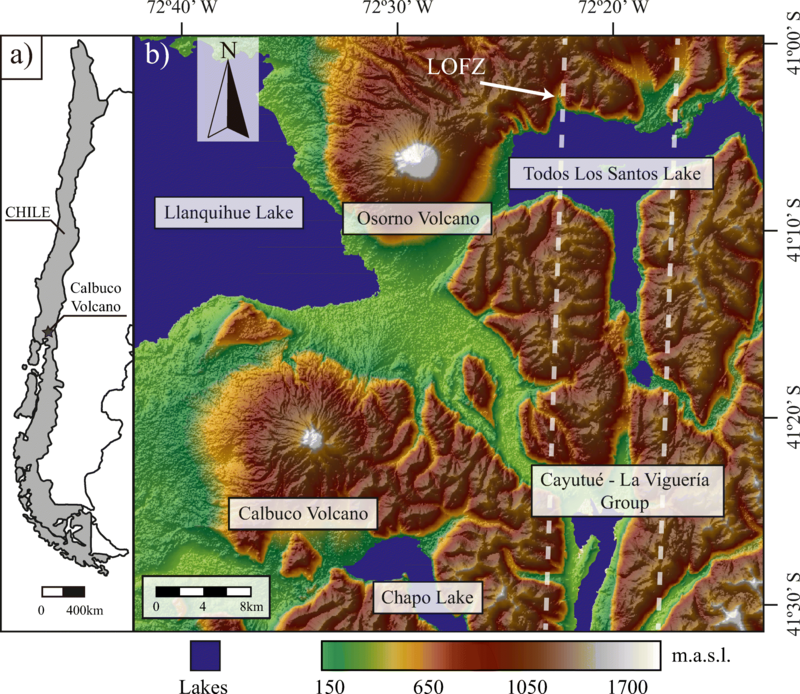 Shallow reservoirs in the Southern Volcanic Zone of the Andes have also been inferred via changes in rigidity of the upper crust (Morgado et al. 2017) and the compressive intra-arc tectonic setting (Cembrano and Lara 2009; Chaussard and Amelung 2012). Together, these results suggest that a complex system of chambers extending from deep to shallow levels may be commonplace at Andean volcanoes. Delgado et al. (2017) have suggested a prolate, pressurised spheroid shape for the reservoir beneath Calbuco volcano via modelling of the co-eruptive subsidence signal. 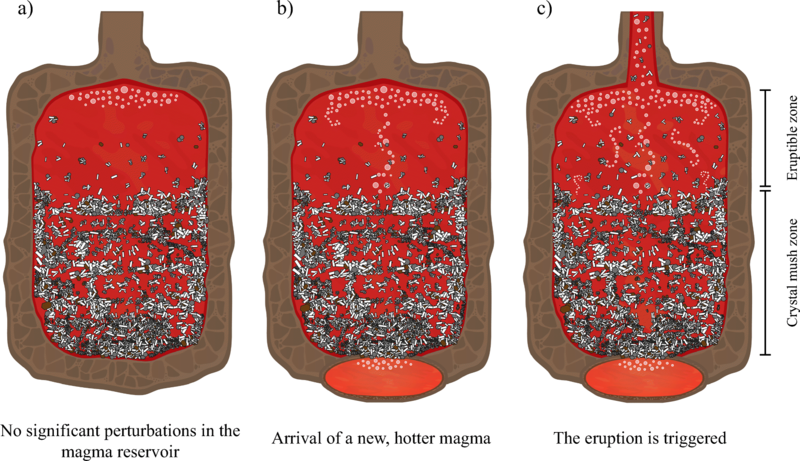 According to the time-dependent numerical modelling of an evolving magma chamber by Gutiérrez and Parada (2010), thermal heterogeneities are much more likely in stock-like than sill-shaped chambers. Considering long-term thermometry (via two-pyroxenes, amphibole-plagioclase, amphibole and Ca-in-olivine geothermometers; see Tables 5 and 6), sample Cal-160 shows systematically lower temperatures than all other samples (Fig. 10). Fe–Ti oxides thermometry is commonly used to estimate immediately pre-eruptive temperatures (this being ‘short-term thermometry’—Ruprecht and Bachmann 2010; Brahm et al. 2018), and here sample Cal-160 shows systematically lower temperatures for core–core equilibria of in-contact ilmenite–titanomagnetite pairs (see Table 7). According to Gutiérrez and Parada (2010), in modelling of stock-like reservoirs, the highest temperatures related to crystallinities of between 30 and 40 vol.% are found in the middle of the reservoir. This is a feature of all samples except Cal-160. Instead, lower temperatures related to crystallinities of ~ 60 vol.% are found at the bottom of the reservoir, as is consistent with features of sample Cal-160. In addition, sample Cal-160 is slightly more evolved than all other samples (lower Mg# and higher SiO2 wt.%; see Fig. 3). This, according to the Gutiérrez and Parada (2010) modelling, is also consistent with the location of Cal-160 in the lower zone or at the borders of the magma chamber. In-contact ilmenite–titanomagnetite pairs exchange elements (e.g. Fe2+ + Ti4+ ↔ 2Fe3+; Ghiorso and Sack 1991) across the interface, which can be used as thermometer and oxygen barometer (Ghiorso and Evans 2008; Sauerzapf et al. 2008). As a consequence, such boundaries respond rapidly to changes in the intensive physical properties of temperature and/or oxygen fugacity within the reservoir (Lasaga 1983). Therefore, we can postulate that crystal core compositions may represent older, relatively long-term temperatures, whereas rim compositions give information of changes of temperature over a short timescale immediately before eruption. Rim compositions (close to the interface of the crystal pairs) yield considerably higher temperatures than core compositions only in the sample Cal-160 (70 to 220 °C higher relative to crystal cores; Table 7). The remaining samples show similar Fe–Ti oxides temperatures for cores and rims, with no late heating stage. Additionally, the compositional zonations in orthopyroxene, clinopyroxene and plagioclase phenocrysts (see Figs. 5, 6 and 9) are within the crystal clots as well as in contact with the groundmass, suggesting these zonings were inherited from the crystal mush development stage. This development period would not be associated with zoning due to an ionic exchange as response to the same heating as Fe–Ti oxides recorded because the silicate phases have much lower ionic diffusivities and record older stages of the evolution of the system. Sample Cal-160 is unique across the sampled deposits as being the only material that records evidence of heating. Its composition and crystallinity make it representative of the bottom of the mush reservoir. The heating that this sample records seems both localised and intense, consistent with an input of hotter magma. Underlying recharge of hot magma has been suggested as a trigger for many eruptions of Southern Andean shallow reservoirs (e.g. Quizapu, Ruprecht and Bachmann 2010; Villarrica, Lohmar et al. 2012, Morgado et al. 2015). Some eruptions have also involved the presence of a mush zone (e.g. Llaima, Bouvet de Maisonneuve et al. 2012; Quetrupillán, Brahm et al. 2018). The nature and extent of magma mixing in such situations has been further proposed to influence eruptive style: Ruprecht and Bachmann (2010) suggested that increasing degrees of magma mixing (between felsic magma and a more mafic recharge) decreases the fragmentation efficiency and magma viscosity, and thus favours effusive eruptions. Restricted compositional interaction between the new magma influx and an overlying crystal mush could occur because of the mush acting (at least initially) as a rheological barrier (Huber et al. 2009; Kent et al. 2010) or because of the occurrence of a volatile layer between the hot magma and the crystal mush (Bachmann and Bergantz 2006; Huber et al. 2010b; Parmigiani et al. 2014; Schleicher and Bergantz 2017; Spera and Bohrson 2018). In this situation, only small magma volumes could be reheated, favouring explosive eruptions (cf. Couch et al. 2001; Ruprecht and Bachmann 2010). Data presented here suggest that this was the case for the April 2015 Calbuco eruption. Our results are consistent with those from Castruccio et al. (2016) who, based on stratigraphy and whole-rock geochemistry, suggested that the April 2015 Calbuco eruption was triggered by either volatile exsolution or a moderate-sized magmatic intrusion of a new magma into the base of the reservoir with almost no mixing effects. The 2015 Calbuco eruption is an example of a shallow, crystal-rich magma reservoir feeding a moderate-sized eruption (~ 0.3–0.6 km3 erupted products, non-DRE). Based on textural and compositional criteria of nine representative samples, we conclude the existence of a mush reservoir, which amphibole barometry indicates to lie within the upper to middle crust (at 5.5–9.5 km depth), consistent with previous works (SERNAGEOMIN 2015h, i; Delgado et al. 2017). A prolate spheroid shape of the reservoir has been inferred from previous studies and, based on detailed thermobarometry, crystallinity and the compositions of nine representative samples, we infer that all samples of this study (except Cal-160) are derived from the middle of a mush reservoir. Sample Cal-160 represents a portion of the rheologically rigid basal envelope. In addition, based on Fe–Ti oxide (ilmenite and titanomagnetite) thermometry and textural features of the crystal-clot-rich Cal-160 sample, we identify a localised heating event of 70–220 °C, reaching potentially as high as 1070 °C. This mobilised magma represented by Cal-160, an event which we infer to be linked to eruption triggering (Fig. 12) and that would have affected only the magma reservoir at its highly crystalline (mush) base. The absence of a heating record in the remaining samples suggests that all other magma remained thermally and chemically unaffected by the trigger pulse during eruption. This emphasises the need for rapid warning systems to communicate hazards rapidly to the local population. We acknowledge the help in the field of Marcela Vollmer. We acknowledge Richard Walshaw for assistance with the EPMA, and Duncan Hedges who provided assistance with the SEM at the University of Leeds. Financial support through FONDAP project 15090013 (Centro de Excelencia en Geotermia de los Andes, CEGA), CONICYT MSc fellowship (22141497, RB) and CONICYT PhD fellowship (72160268, EM) are acknowledged. We would like to specially thank to Claire Harnett. We thank two anonymous reviewers for their detailed and constructive comments. Editorial handling and constructive comments of L. Pioli and A. Harris are greatly appreciated.